Today's swatches are "from the vault" seeing as I REALLY don't want to take off my Magneffects polish (I have Velvet Groove on right now... LOVE) and also because I'm waiting for the breaks in my nails to grow out. I ordered these Tuff Scent polishes directly from their site a little while ago, and had an excellent experience. I originally ordered Wisdom and Loyalty (as a present for my mom because her favorite scent is Lilac). When they arrived, the Wisdom had been open a bit and dried out in transit. I contacted them about it and their co-owner Sylvie got back to me right away and let me know that they'd send another out immediately and they she'd throw in another bottle of my choice for the trouble. And that's how I ended up with Inner Strength as well. I love gold glitter, so Wisdom was a winner right off the bat. However, the formula is kind of "gloopy" (even the non-dried out one), but not unmanageable. Also, in the bottle it looks more pale and warm-toned, but the slightly yellow-tinted base gives it a more bright cool-toned look overall. The scent is very nice and not overwhelming, and really does have a nice grapefruit smell once it dries. Inner Strength reminds me of all the other taupes out there these days, but it's still a very nice chic color. It's a little sheer, so it took me three coats for this picture and it may still have a couple bald spots. Also, I'm not sure of the scent on this one. Maybe I didn't wait long enough for it to dry all the way (since this is only a swatch), but it was a little bit strong. I'll have to try it again for a full mani and see if the scent becomes lighter once it's fully dry. I'll have to borrow Loyalty (lilac scent) from my mom sometime to do a swatch, but I CAN tell you that both I and my mom have tried it on and it's a beautiful two-coat dark blue and the scent is very nice. I definitely recommend Loyalty. I do recommend buying Tuff Scent polishes from their site - they are truly unique in the scents they offer, and they have EXCELLENT customer service! I will definitely be ordering more in the future! WOW, that gold is amazeballs!! What an interesting concept and wha a beautiful glitter! 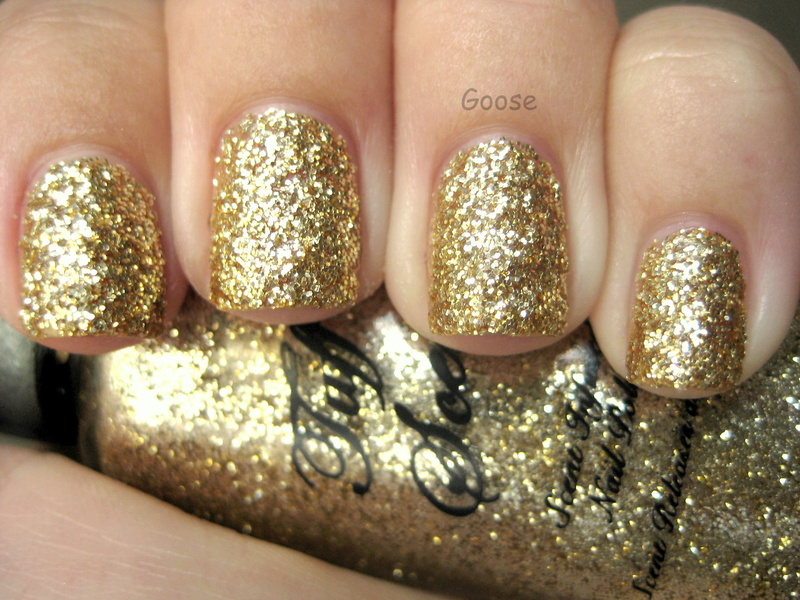 Love gold glitter :) Looks fun, and I can already imagine myself wearing it!